PRAIRIE VIEW — It was not Ruth Simmons’ first time being memorialized on a T-shirt. 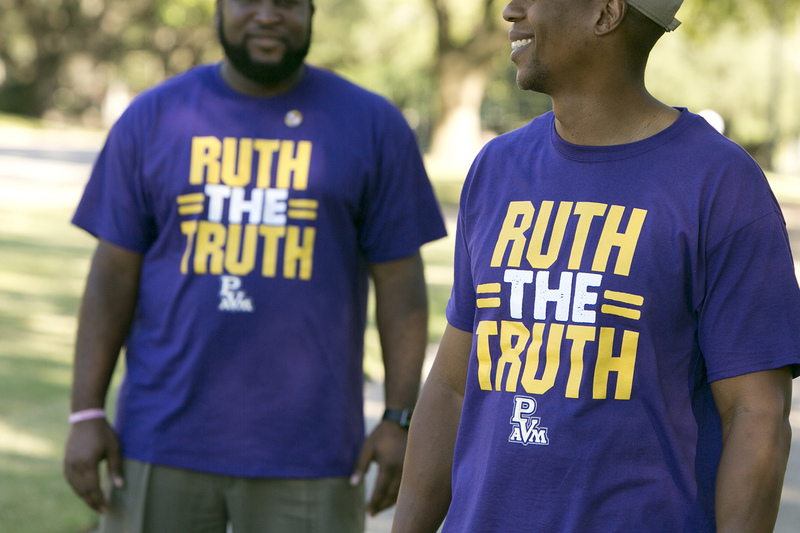 Still, seeing the purple “Ruth the Truth” shirts around the Prairie View A&M University campus during homecoming week made the former Brown University president put her hand to her face and shake her head. “I cannot comment on another person’s bad idea,” she joked. The purple shirts were a sign of the excitement on the historically black campus last week. Not only were students and alumni gearing up for the weekend’s festivities but also Simmons, a high-profile black administrator who took up the Prairie View presidency on an interim basis this summer, had just accepted the permanent job. Simmons may be uncomfortable with all the attention, but she has given her new students a lot of reasons for enthusiasm. 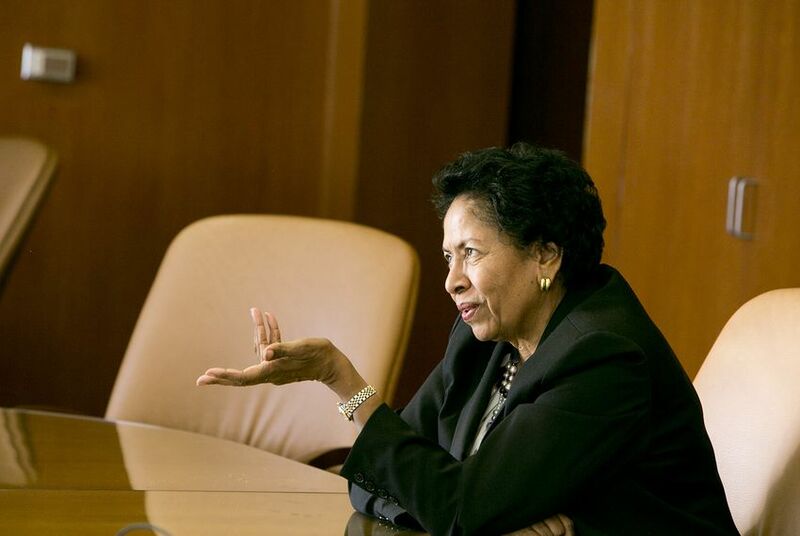 She was the first African-American to lead an Ivy League school and TIME magazine’s 2001 best college president. During 11 years at the helm of Brown University, she instituted need-blind admissions for students, created a initiative to study the university’s historical ties to slavery and led a $1.6 billion fundraising campaign. Once she is officially confirmed by the Texas A&M University System Board of Regents, she'll be Prairie View's first female president. Simmons blames students — “their determination, their commitment to try to better themselves" — for bringing her out of her quiet five-year retirement. 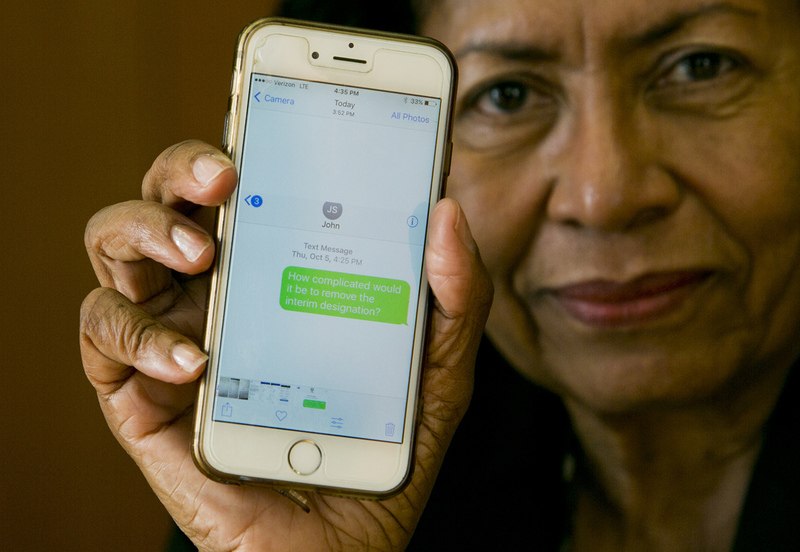 Staying on permanently, a choice she began to mull just weeks after arriving on campus, became more tempting when she watched students affected by Hurricane Harvey return to school after losing their homes. And she settled on the decision in early October after a difficult administrative meeting. “How complicated would it be to remove the interim designation?” she texted A&M System Chancellor John Sharp after returning to her office. “What appealed to me about Prairie View was that it was not more of the same,” she said. Prairie View may not offer the notoriety Simmons is accustomed to, but she will likely generate notoriety for the school — and use that newfound prominence to serve students. Prairie View has drawn perhaps the most attention in recent years for the case of Sandra Bland, who was stopped by police steps from the university days before she died in a Waller County jail cell. Simmons’ hire has already begun to turn that tide. And her vast professional network and fundraising abilities will be critical for a growing school hoping to up its undergraduate enrollment from 9,000 to 12,000 in the next three years. Sharp said the university has already received a fundraising boost since Simmons arrived. Simmons said her focus will be on the classroom. She wants to raise the university’s profile by recruiting top research faculty and inviting world-renowned speakers to campus. She wants to encourage students to take advantage of international opportunities like study abroad and to expand the suite of options available to them. “I want these students to know that they are fit to be in any setting, fit to be with any people they encounter, fit to learn from a lot of different settings,” she said. Sharp said the new job does far more for Prairie View than it does for Simmons. He traced Simmons’ history of supporting HBCUs — he said she left a top administrative post at Princeton University in 1990 to spend two years rehabilitating Spelman College when "it was in trouble," and after Hurricane Katrina, she spearheaded efforts from Brown and Princeton to support her storm-ravaged alma mater, Dillard University — to her October decision to stay on at Prairie View. Simmons has worked across what she called the “continuum of learning,” at small women’s colleges and large research universities. But historically black colleges and universities carry special significance for her. And for Simmons, Prairie View is also home. Simmons grew up in Houston’s Fifth Ward and remembers watching her older brother Clarence play basketball at Prairie View. (He was on the same team as a future NBA hall of famer, Zelmo Beaty.) Returning to Texas has helped her reconnect with the 11 siblings she hasn’t lived near in decades. Simmons’ colleagues from Brown said they were hardly surprised to see her re-enter the academy. In the buzz of homecoming anticipation, students last week identified mostly modest improvements they’d like to see — improved campus wifi, say, or more dumpsters near the freshman dorms. Simmons’ vision is grander and more expansive. When she accepted the interim president job, she promised not to be a placeholder. Now that she’s there for good, she promises to elevate the school. Disclosure: Prairie View A&M University and the Texas A&M University System have been financial supporters of The Texas Tribune. A complete list of Tribune donors and sponsors can be viewed here.